Pete Goldin’s article in BSMdigest makes for interesting reading. The article lists the top 5 features to look for in a VM management solution. Agree on all counts. 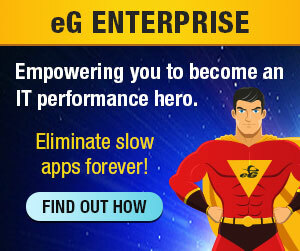 Thats why eG Enterprise’s virtualization monitoring solution has all of these covered! Isn’t it interesting that virtually all management software players suddenly manage VM environments? Similar to everyone being able to perform ‘root-cause’ analysis, this is marketing hype for the vast majority of players. I remember (I think it was EMA) commenting on eG’s foresight in the design of the product over 3-4 years ago. Embedding the correlation logic into the monitor makes eG better by design, and this has been proven repeatedly over the past 4 years or so by consistently broadening the scope of the monitored environment (web, Citrix, ERP, now virtualized infrastructures) without ‘re-engineering’ the whole product. Looking to your legacy provider for this may result in significant frustration, lost time and may work against the cultural transformation needed to achieve true service management. EMA mentions five key capability areas when implementing processes and technologies for ensuring performance and availability in a virtual infrastructure. Tools should automatically locate, identify and provide insight into the complete topology of each IT service; and should subsequently maintain an up-to-date record of all these components. Discovery should be able to detect physical servers, virtualization platforms, virtual hosts and guests, and the applications on top of them, as well as the relationships and connections between them. Ideally it will also provide (or integrate with) a ‘single source of truth’ for storing discovered systems, such as a federated configuration management database (CMDB). Virtual environments always run on top of some physical infrastructure (and EMA research shows most enterprises plan to retain a substantial non-virtual environment for the foreseeable future). Therefore, it remains important to monitor the availability and performance of the underlying physical system and components. This includes detail of granular resources, network performance, file I/O, system uptime, response times, etc. This is of course a critical differentiator for VSM tools. They must monitor performance metrics (response times, resource utilization, I/O rates, etc.) of dynamic virtual systems in real time. They should be able to track applications and components as they migrate, and still maintain appropriate (service-specific) performance profiles. They should also be able to monitor multiple virtual environments simultaneously – across multiple platforms, technologies, vendors, hosts, subnets and even data centers. In order to understand the performance and availability of a complete end-to-end service, tools must be able to monitor the complete operating environment that delivers that service. This includes servers, applications, databases, middleware, networks, storage, client connections and more, with an in-depth understanding of the virtual platforms, the resulting patterns of dynamic resource utilization, and how changes to specific component metrics will affect overall service performance. All these capabilities must be connected into a single view that holistically integrates visualization, event correlation, detailed reporting and predictive alerting. This should connect all the diverse physical and virtual components that deliver an IT service, and measure not just from the inside out (measuring performance and availability of components within the data center), but also from the outside in (measuring response time, availability and end-user experience at the client).